What Happens If You Lie on a Car Insurance Application? Home/Car Insurance/What Happens If You Lie on a Car Insurance Application? 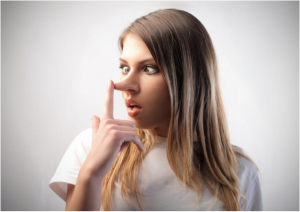 Although your mom probably told you never to tell a lie, the truth is that most of us tell little white lies when it suits. We might do this to spare a friend’s feelings or to extricate ourselves from a potentially difficult situation. The main reason why most people lie when filling in their car insurance is because they are trying to save money. In many ways, this is entirely understandable. After all, auto insurance for a large proportion of applicants is expensive, and if you are a young driver it may well be prohibitively so. In this instance the lies will come all too easily — and they will be easily justified by the fact that you are saving hundreds of pounds as a result. Lying is not just about deliberately offering the wrong information to the insurer. Failing to disclose certain pertinent facts is lying by omission, and is just as bad as a barefaced lie. Not disclosing that you have a few points on your license or that you are actually using the vehicle for work will probably save you money in the short term, but an omission like this could come back and bite you at a later date. What are the Most Common Lies on Car Insurance Applications? Car insurance application forms are very long and can take oodles of time to fill in. The easy bits are your name, age, address and occupation, but there are some people who can’t even get this bit right. Yes, there are people out there who deliberately claim to be someone else or a few years older in order to save money. They are also likely to suffer from amnesia when asked about current driving convictions. Other areas where the truth is routinely bent include estimating the annual mileage and saying where the car is parked overnight. For example, you might tell the insurer that you only drive 5,000 miles per year and that your car is parked in a secure garage with CCTV cameras all over the place when in fact you drive at least 2,000 miles every month and you regularly abandon it on the roughest council estate in the area. In the days before technology became such an intrinsic part of everyone’s lives, it was a lot easier to pull the wool over an auto insurance company’s eyes. You could tell them all kinds of porky pies and unless someone joined the dots, it was unlikely you would have been caught out. However, times have changed and these days, insurers routinely swap information with DVLA and other official bodies in an attempt to cut down on insurance fraud. Insurance companies will go to great lengths in search of the truth. Data mining involves using sophisticated tools to trawl through information databases so that anomalies can be spotted. So if you state that your new car will be parked in a secure lock-up at your home, but you are listed on the electoral roll as living somewhere completely different that has a less favorable postcode, don’t be surprised if your insurer figures this out. There is a common perception that there is nothing wrong with lying on a car insurance form to secure a cheaper premium. For starters, if you are caught out, perhaps because your car is involved in an accident and the false information you gave comes to light, it will cost you dearly. Your insurance company may refuse to pay out or even seek to recover damages from you. You will also be blacklisted by other insurance providers. Another point worth considering is that your lies only serve to increase the insurance premiums of everyone else. Lying on your insurance is effectively taking out an insurance policy under false pretenses. Making a claim when perhaps you were not entitled to insurance cover in the first place is an extra cost insurance companies have to bear, which they then pass on to everyone else in the form of higher premiums. So for every lie you tell when filling in an insurance application form, some poor honest Joe has to pay more for his cover. Does that make you feel guilty? If not it should do! The upshot here is that you don’t have to lie to obtain cheaper car insurance. Yes, insuring your vehicle may sometimes cost you more than you’d like to spend, but if you shop around, it is possible to save money on car insurance. *Talk to one of our agents to learn more about car insurance discounts.